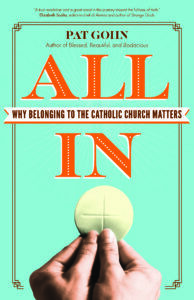 This is an excerpt from my latest book, All In: Why belonging to the Catholic Church Matters. I read part of the introduction. I loved this Intro podcast of your book. Even though I already read it awhile ago, I enjoyed hearing it . Your voice inspires. Thank you, Pat. You are a Blessedly Beautiful and Bodacious woman. I will finish your book now that the Timeline and Easter Festivities are over. Yes, I am “All In”. Thank you for all you do. God Bless.